The Nuclear AMRC visualisation team develops virtual environments to support our work in product design, planning, assembly and training. Evaluation and training for assembly, repair and maintenance. We can produce interactive VR models from standard CAD data, and integrate many different kinds of CAD file – from individual components to plant architecture – to create a detailed immersive environment. We can also integrate data from discrete event simulation and finite element analysis software to create four-dimensional environments which change over time. For more information, contact Craig Hamer, Nuclear AMRC virtualisation research engineer. 4.5 metre wide single-screen system with 3D back projection and 4K resolution. Can be viewed by up to 25 people. 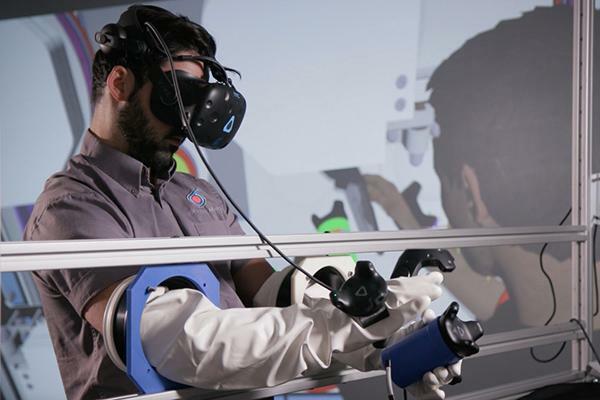 Can be linked to off-site VR facilities for collaborative working. Hands-free technology for virtual reality and augmented reality. Current equipment includes Oculus Rift and HTC Vive. Applications in training, guided assembly, repair and maintenance.